I hope our newsletter finds you well. We had an awesome time at the EmpowerLA Awards and Neighborhood Council Volunteer Recognition Event last Friday night. HUGE thanks to the Congress of Neighborhoods Planning Committee, particularly our Commissioner Lydia Grant, for the planning and flawless execution of a wonderful evening celebrating all things Neighborhood Councils in a standing room only event. 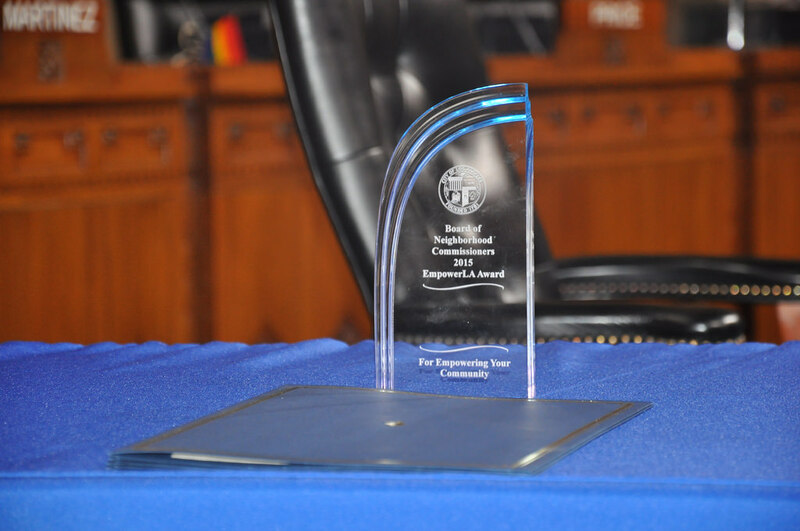 In addition to the great Neighborhood Councils who won the Board of Neighborhood Commissioners' EmpowerLA Awards (more info below), I was happy to launch our own Neighborhood Council Spirit Awards, which honors individual Neighborhood Council leaders whose amazing work resonates beyond their own Council to positively affect many other Neighborhood Councils. Please read more about our inaugural winners below. The Congress of Neighborhoods is next Saturday, Sept. 26th, so please register now. We want to make sure we have enough materials and food throughout the day. On Saturday, I had a great working session at the Elections Town Hall where we locked down online voting time frames and election challenge remedies. Look for an updated Elections Manual coming your way next week. After finishing the town hall in Hollywood, I raced (within the speed limits of course!) over to Canoga Park Neighborhood Council's 10th Anniversary All America City event. President Corinne Ho was the perfect host to a wonderful celebration that brought community members of all ethnic backgrounds out in beautiful traditional outfits. Former Councilmember Dennis Zine joined in on the festivities, which packed the room. There were wonderful performances, including one with Canoga Park Neighborhood Council board member Saaliha Khan where she asked an imagined Gandhi about how communities live in peace together. The response? A reference to EmpowerLA's Empower Yourself tagline. Great fun! We had some more fun this week with another group of international visitors from Germany, who wanted to learn techniques for including immigrants into communities more effectively. Many thanks to Neighborhood Empowerment Advocate Melvin Canas for leading that discussion. We also welcomed Josh Weinberg, the Neighborhood Administrator, from the City of Fort Collins, Colorado. Josh spent most of the week with us, attending Neighborhood Council meetings, and talking with staff because the City of Fort Collins wants to develop a more robust civic engagement system. He was very impressed with the work of the Neighborhood Councils and EmpowerLA and will be taking back many recommendations to Colorado. Next week, we'll be meeting with international visitors from Korea! Speaking of cool meetings, I met with Bureau of Sanitation Director Enrique Zaldivar this week to discuss opportunities for Sanitation to have ongoing dialogues with Neighborhood Councils. Enrique reached out a few months ago about hosting an educational seminar on their Hyperion Treatment Plant, which is one of the American Public Works Association's Top Ten Public Works Projects of the Twentieth Century. We also spoke of how to ensure the Neighborhood Council Public Works Liaisons can have influence on Sanitation's work, particularly on the Clean Streets Initiative. A lot of neat things are on the horizon, so make sure you get your liaisons appointed ASAP. 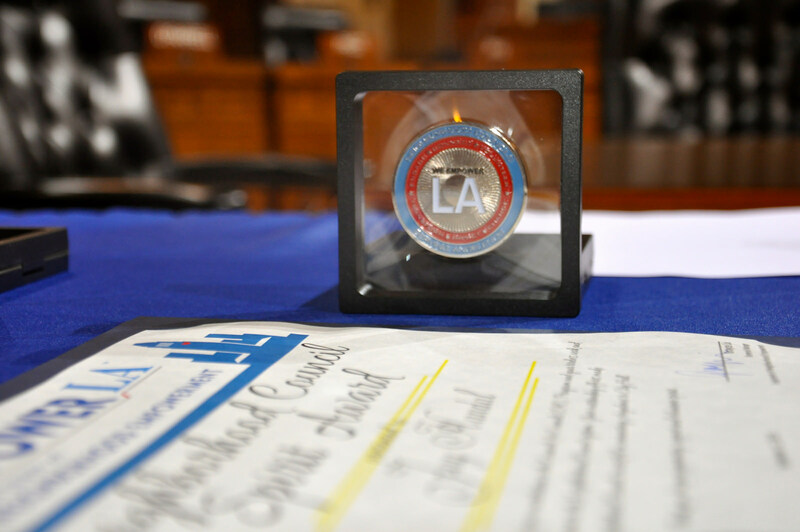 I was happy to stop by the South Los Angeles Alliance of Neighborhood Councils last night because two of our new Neighborhood Council Spirit Award winners, Ted Thomas of Park Mesa Heights Community Council and Lonella "Joy" Enix from Empowerment Congress Southwest, were there to receive their certificate and special, made with love, EmpowerLA Challenge Coin for their work on the SLAANC. If you've got that Neighborhood Council Spirit, look out! I may be stopping by your Neighborhood Council meeting to honor you for it. Neighborhood Council Advice Division (NCAD) Deputy City Attorney Carmen Hawkins was honored today by the Board of Public Works for her service to the community above and beyond her job at the City Attorney's Office. Led by Commissioner Mike Davis and flanked by City Attorney Mike Feuer and Special City Attorney Capri Maddox, Carmen was presented with Certificates of Recognition ..
Join us Tuesday, October 6, 2015 for a job fair and employment workshop for veterans, active duty military members, guard and reserve members, and military spouses at the American Legion Post No. 43. Make a Plan, Build a Kit, Be Informed! Having served over 238,000 students and families over the past fourteen years, L.A. Cash for College is recognized as the primary source of college information for local students who want to attend college and pursue high-wage careers.